is Packed with OutStanding New Features. Normally we don't give out awards for simple – non electric products, but this is a must have for anyone with a car – so for these reasons I am awarding it with our Player Editor's Choice Award. Plain and simple, this is a great system for price, and each component is worthy of our high recommendation. I like that the magnet on this one is the mount and not on my phone. 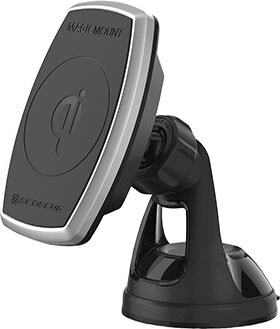 The magicMOUNT is ideal for cellphones, smartphones,multi-media devices, tablets, GPS systems and even keys! You can easily move your mobile device from your windshield to your desktop to your wall without removing your phone from the case of your choice. Owners need to only apply the MagicPlate directly to their device or place the MagicPlate under the battery cover of their smartphone and, viola! You can now put your device over the magnetic magicMOUNT to attach it and lock your device into place. Now that is real innovation and simplicity at work. Scosche has really nice reliable Qi charging that we've liked for years. Scosche's MagicMount Pro Charge gives you a top notch wireless charger that places your phone in perfect view and without any cumbersome gadgets to keep it in place. I wore the Rhythm+ for a week to my regular skating practices and weight training sessions. From those workouts, it proved significantly more accurate than my usual Apple Watch tracking (I used Bluetooth to connect to the Rhythm, but it also offers ANT+ support for cyclists). At the end of the day, the BoomBottle MM is simply a really good speaker. Speaking of cool features, the BoomBottle MM features auto-sensing indoor/outdoor EQ, letting it adjust its sound to fit wherever you are. This Bluetooth speaker looks and sounds great, and the build quality is second to none. Not only is it a water-resistant, IP67-rated Bluetooth speaker, but it also features a couple of useful things that’ll make it more of a social companion than anything else. Another incredible feature on the Rhythm 24? 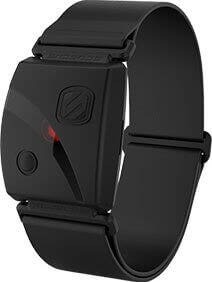 It tracks your underwater heart rate! The Scosche ReVolt Dual USB Car Charger is a low-cost but high-performance device that channels maximum power from your car’s DC outlet to your compact devices. The RH1060 are some of the best sounding wireless headphones I’ve ever tried. Today, I tried the two BoomBottleMM Bluetooth speakers you sent me and was incredibly impressed with the sound, especially given their size and portability. I normally listen to classical music on a good system including a high-end Moon amp and Magnapan speakers, and these Scosche speakers sound excellent, even in that context. I also tried them on my outdoor terrace where they manage to create a great quality sound in an open area. I really don’t know how you did this, but I’d like to buy two more for my second home. Congratulations on a job well done! The sound quality and ease of use is amazing.